We’re taking it up a notch! Since we began publishing this blog in 2013, we’ve learned so much from your feedback. In fact, your insights and stories were so valuable, we asked ourselves how we can get you more involved. The answer? We’re inviting you to become co-authors and help shape our content as it develops! Starting this week, we’ll be publishing e-book segments focused on things that are happening right now, changes in the world of work that effect all of us. And we ask you to share your insights, stories and opinions; anything that helps clarify, illustrate or extend the topic. 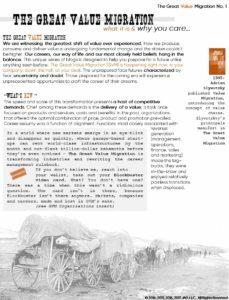 We begin today with an e-book series examining, the greatest career challenge (and the greatest opportunity) we’ve faced in a generation: The Great Value Migration. What are your thoughts? Do you feel it? Is it affecting your organization or career? Reach out directly at jeff@jeffkaplan.com or text me at (310) 220-5139.